← 12 weeks (3 months) today! Pastor Peter is a wonderful pastor from Zimbabwe who is doing God’s work in Africa to spread Christ as well as meet the needs of a country that is not only in political upheaval, but these people lack the basic necessities that most of us Americans take for granted. They don’t have food, they sometimes lack shelter, running water and electricity, and in these horrid times all they have to rely on is their faith. Pastor Peter has made it his life’s work to share Christ with his people and to help meet their needs. Many of you know that Matt and I met Peter last year and he gracefully prayed over us that God would answer our desire to have a baby after 5 losses. Two weeks later, I was pregnant again, and carried to term with no complications whatsoever. Pastor Peter was the catalyst for our miracle baby, and we thank God for him and his faithfulness to do God’s work. Peter is visiting this week from Africa in the hopes of raising money and bringing much needed food and goods back to Africa with him (by container ship) to help his people. We introduced him to Bailey for the first time, which was a momentous occasion for me. He held her and prayed over her. I truly believe she has been prayed for by one of God’s great followers, and it’s a moment I will not forget. I hope one day she gets to meet him and understand the wonderful things he is doing on this Earth. 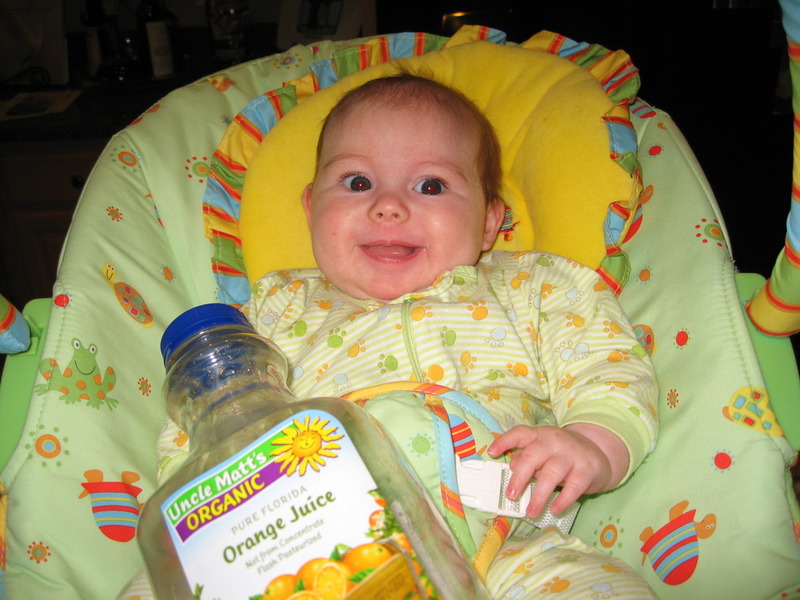 And here is a funny picture taken this week of Bailey with her Daddy’s orange juice. Bailey is becoming such a little character. She has been enjoying lots of music this week (she loves when I play piano and sing to her) and she’s drawing her legs up and over in an attempt to roll over. She’s getting closer! She is also grasping more objects and is following Mommy with her eyes as I move around a room. She enjoyed seeing her cousins Abby, Alex and Madie this week — she can’t wait to play with them one day! MMM... Uncle Matt's is my favorite! Yummy!